The world’s leading provider of digital imaging solutions, Canon U.S.A., Inc. has announced the next evolution in its EOS 1D family, named as Canon EOS-1D Mark IV Digital SLR camera (successor to EOS-1D Mark III), which combines 16 megapixel Canon CMOS image sensor, Dual DIGIC 4 Imaging Processors, 14-bit A/D data conversion, fast 10 fps continuous shooting, advanced Live View shooting and 1080p full HD video capture capability in a single device, aiming to offer professional photographers a comprehensive combination of speed, accuracy as well as image quality. 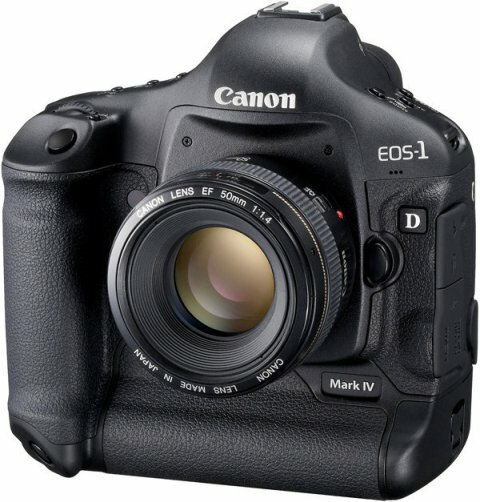 The new Canon EOS-1D Mark IV D-SLR camera which measures 156 x 156.6 x 79.9 mm and weighs in at 1.18 kg is expected to be available in late December 2009 for approximately $5,000 (body only). In addition, Canon also announced its new WFT-E2 II A wireless file transmitter exclusively for EOS-1D Mark IV Digital SLR camera, which scheduled to be available later this year, packing with wireless technologies like IEEE 802.11a/b/g, 100BASE-TX Ethernet connections and built-in WPS for secure connections.